Oh my goodness, these Fried Green Beans are the BEST! I will probably take hits from my family members for saying so. But these green beans are even better than my Mom’s recipe–and that’s saying something. 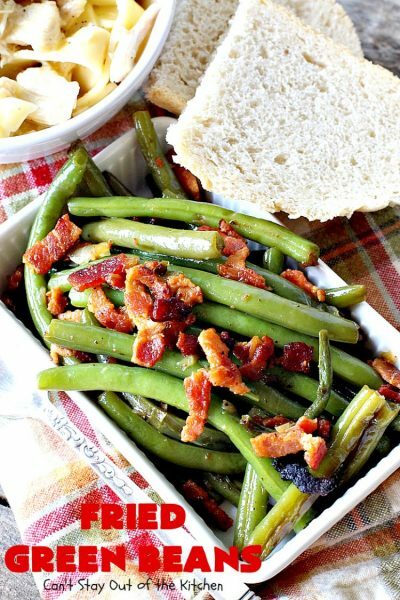 🙂 Believe me, I never thought any green bean recipe could be as good as Mom’s, but this one is. The key difference is not adding water to the beans while cooking. Instead, the beans are covered while cooking, and the steam from cooking drips down into the beans. It’s utterly fantastic. Okay, let me be upfront by stating “bacon makes everything a little bit better.” 😮 While the original recipe calls for five slices of bacon for every batch, I played fast and loose with that amount. I cooked batches with a little more and even significantly more bacon than that amount. My personal preference, however, is more bacon rather than less. 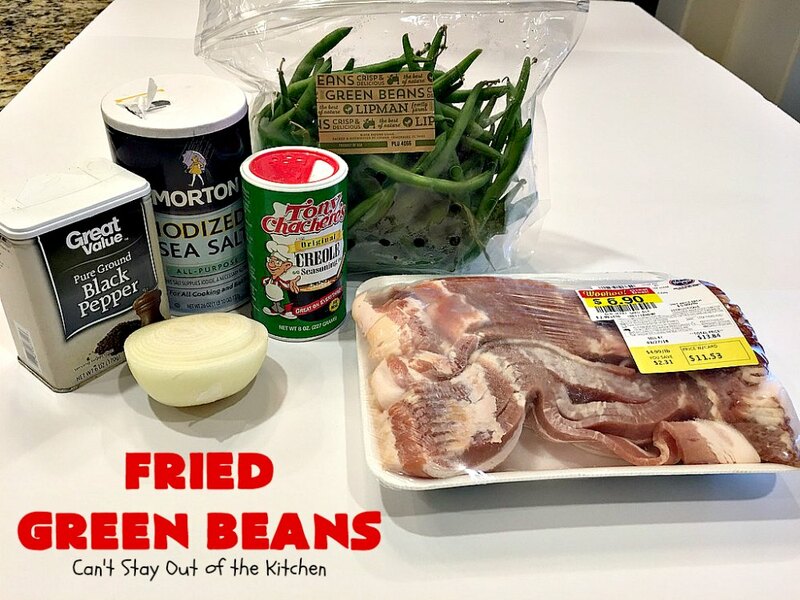 The key ingredient to these Fried Green Beans is the Tony’s Creole Seasoning that’s sprinkled over the beans after cooking. It makes these beans absolutely irresistible. Last month, one of our neighbors invited us over for dinner. Wow, the whole meal was heavenly. 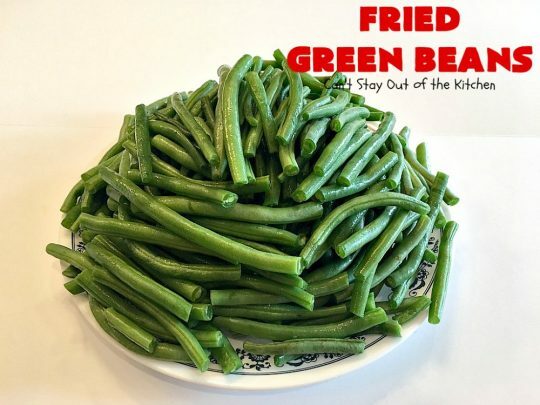 Our hostess made these Fried Green Beans along with Amish Chicken and Noodles, Baked Pineapple, Glazed Carrots, yeast rolls, Favorite Fruit Salad, Deviled Eggs (Creole Style) Boudin Balls and an Oreo Cookie Dessert to die for. Yes, the whole meal was a feast. If you’re looking for a can’t fail, easy, 4-ingredient recipe for green beans, then this has to be the recipe you make. 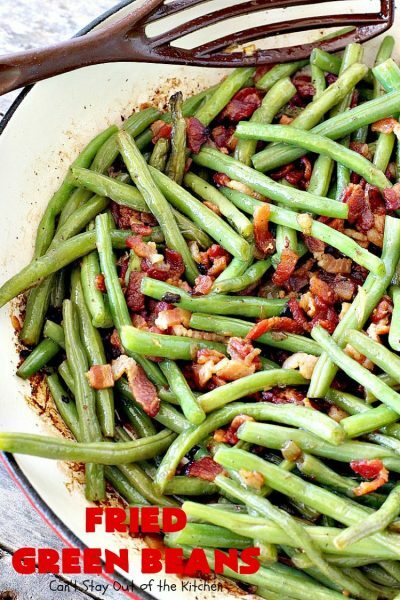 This southern-style way to make green beans really can’t be beat. Sorry Mom. Fried Green Beans are my absolute favorite way to eat green beans. 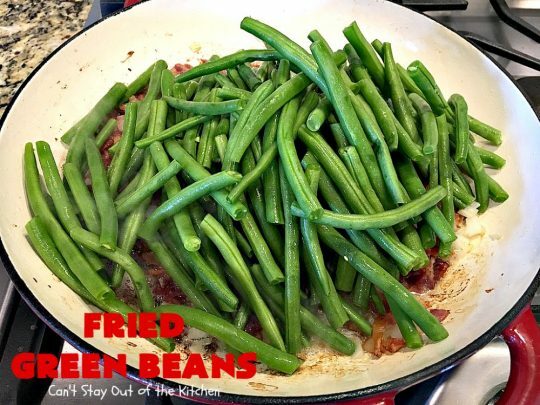 Seriously, every bite of Fried Green Beans will be so hearty and satisfying. 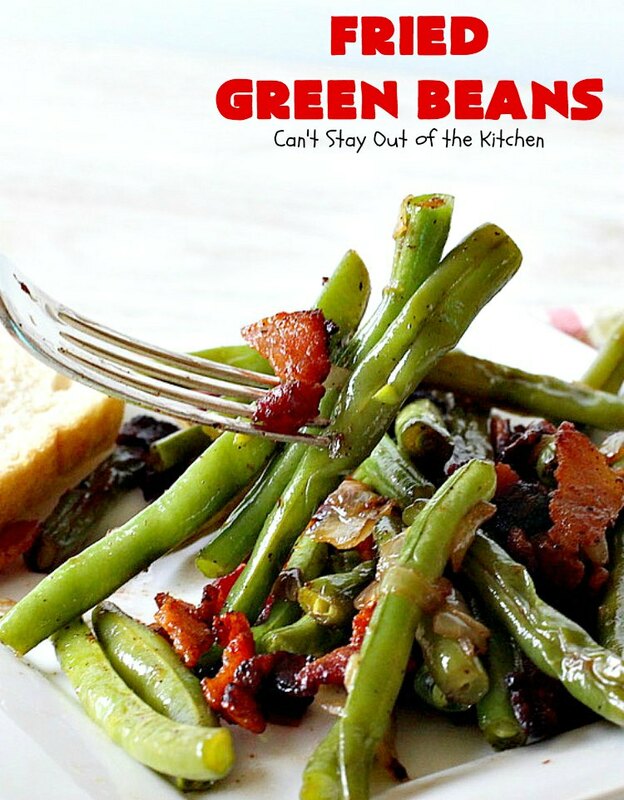 Tony’s Creole Seasoning makes the difference in spicing up these green beans. Just a few sprinkles add delightful flavor. I used these ingredients. You can omit the salt and pepper, if desired. I used a little of each. Slice bacon in thin strips. Cook over medium heat. (I used about three times this amount of bacon). 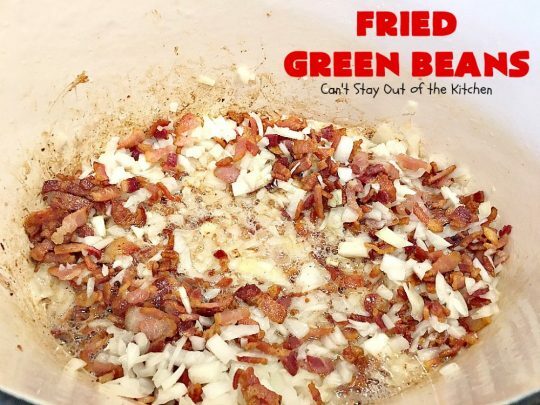 Keep stirring and frying bacon until both sides are cooked through. This will yield quite a bit of grease. DO NOT DRAIN. Add the diced onion and fry until tender – about a minute or so. Meanwhile, wash green beans and cut off the tips. Add green beans to skillet. Stir to combine. Cover with lid allowing a very small opening so steam can escape but also drip into the skillet while frying. Continue frying until beans (with lid almost covered) are cooked through. Sprinkle with Tony’s Creole Seasoning and salt and pepper as desired. Check seasonings. Season with more salt and pepper if desired. 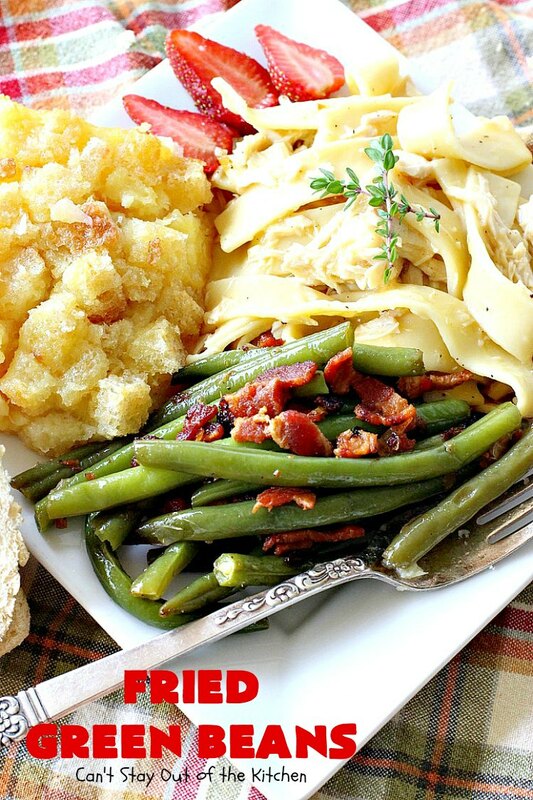 Serve Fried Green Beans with your favorite entree like Amish Chicken and Noodles, Baked Pineapple and Dairy Free White Bread. Fried Green Beans are the BEST! I could eat these green beans without any sides at all. 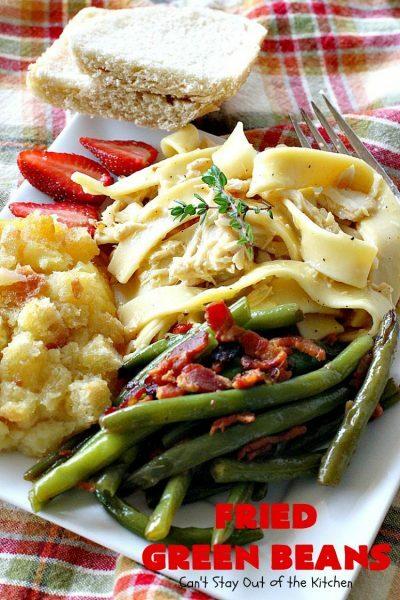 But it’s certainly terrific served with Baked Pineapple, Dairy Free White Bread and Amish Chicken and Noodles. 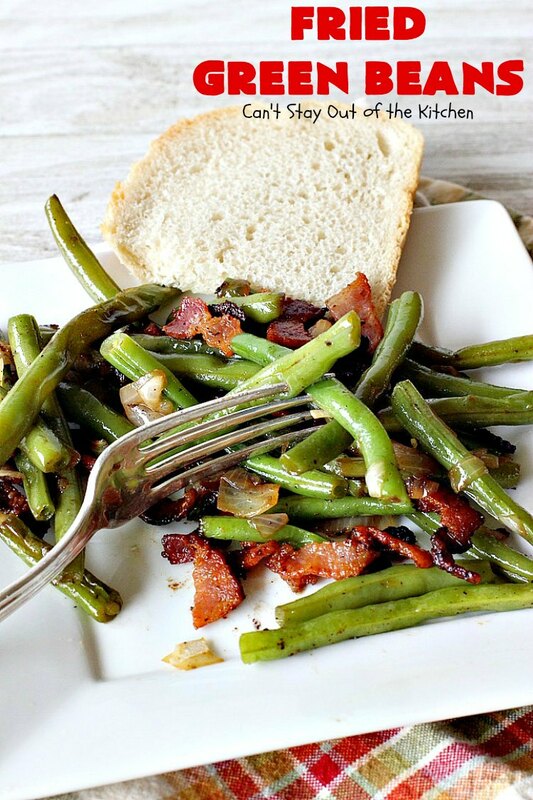 These green beans are not only tasty, they’re gluten free if your bacon is gluten free. 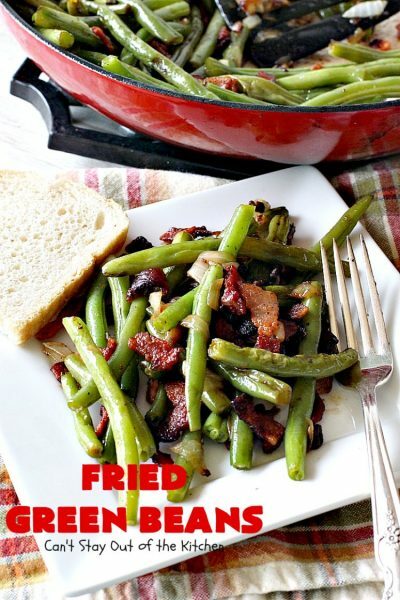 Fried Green Beans are absolutely mouthwatering and a super easy 4-ingredient recipe! This is our favorite way to make green beans as they're fried in bacon drippings with onions and Tony's Creole Seasoning. Perfect side dish for any occasion including holidays like Mother's Day or Father's Day. Gluten free. 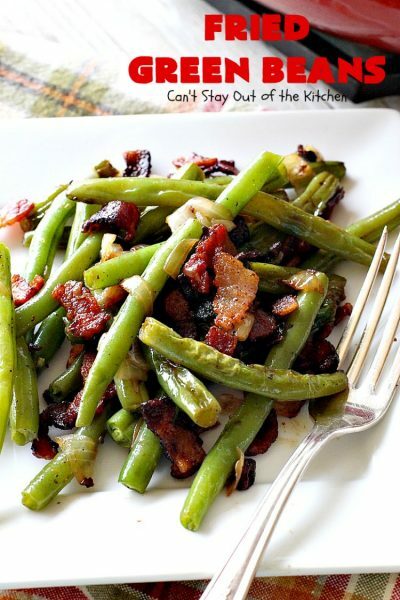 After frying the bacon strips in a heavy skillet, put the green beans and onion in the bacon drippings and fry slowly. Just set the lid on the pot at an angle where the liquid from the steam drips down into the skillet. 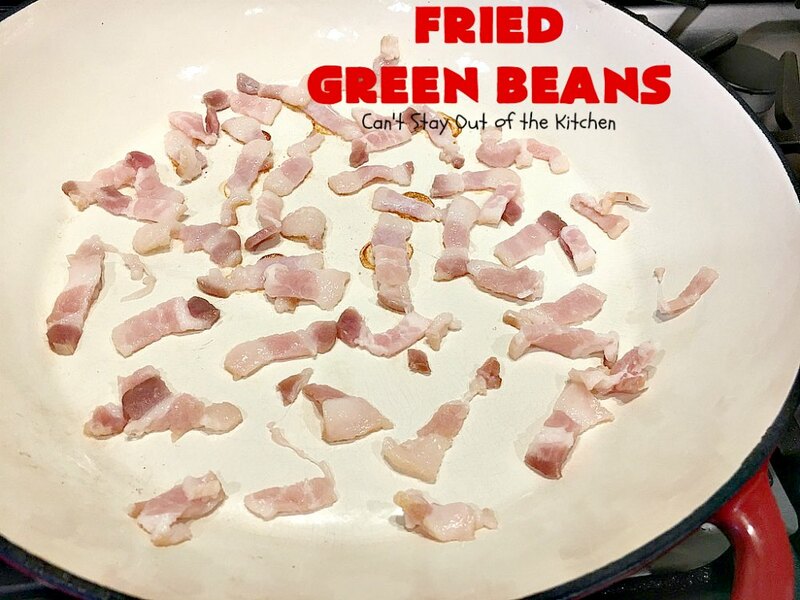 Remove from heat when beans are tender and just starting to brown. NOTE: If you are using canned green beans, drain the beans and dry them off on paper towels. Fry them on high heat since they are already tender. Add the canned sliced new potatoes at the end of the cooking time. NOTE: I do not use the canned new potatoes. NOTE: Amounts of bacon and green beans are approximate. 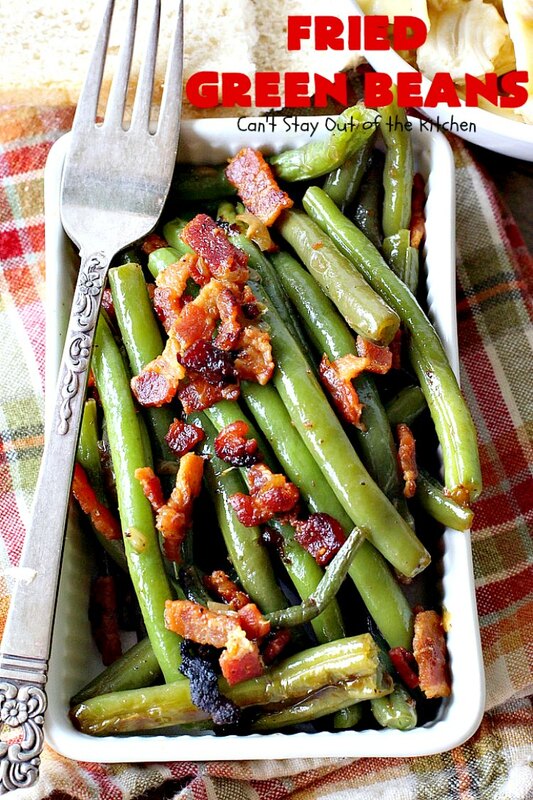 If you want more bacon or more green beans, add more. 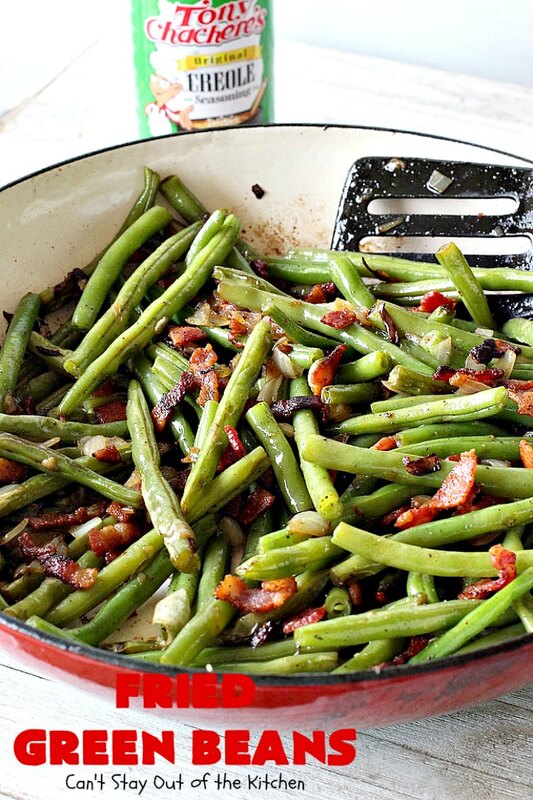 NOTE: I sprinkled about ¼ to ½ teaspoon of Tony’s Creole Seasoning on the finished green beans. This is a preference amount. Season to your taste. 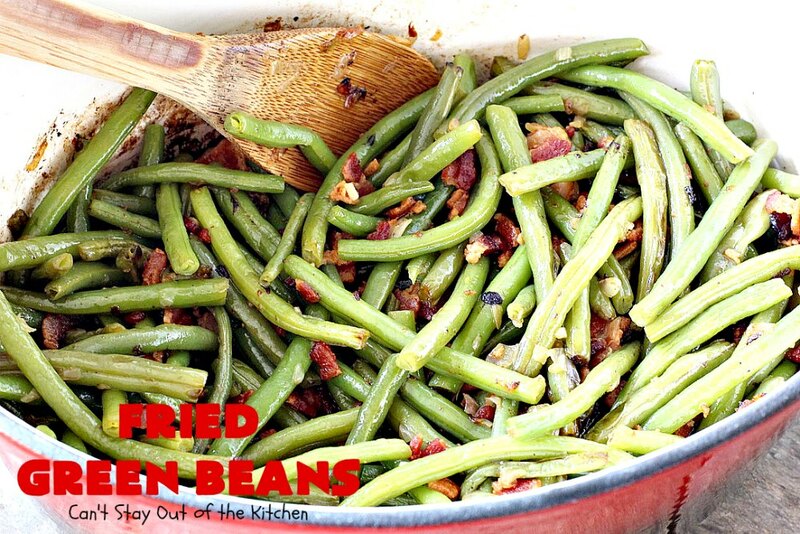 These beans are so good, you better plan to make enough for seconds! 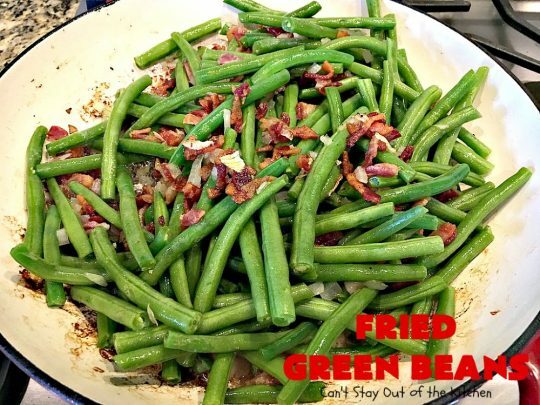 Fried Green Beans is easy and delicious. We served Fried Green Beans with Amish Chicken and Noodles, Baked Pineapple and Dairy Free White Bread. Every mouthful is satisfying southern-style comfort food.